Great Autumn-leaf Viewing Spots found at the suburbs of Tokyo! There are a lot of great autumn-leaf viewing spots scattered around Kanto area. Although there are some great autumn-leaf viewing spots within Tokyo, let us introduce you some of our favorite autumn-leaf viewing spots located at the suburbs of Tokyo for those who want to enjoy autumn-leaf viewing while experiencing the nature. Hikawa Keikoku Valley is situated just a few minute walk away from Okutama Station in Okutama area. This is a spot where you can fully enjoy the nature and easily accessed from the metropolitan area of Tokyo as the station is the terminal of the JR Ome Line. You can enjoy playing in the river in the summer time. There is a 4km (2.48mi)-long promenade that goes around from Okutama Station to NIppara River, Tama River and Mt. Atago, and you can enjoy viewing autumn leaves while taking a relaxing stroll there. 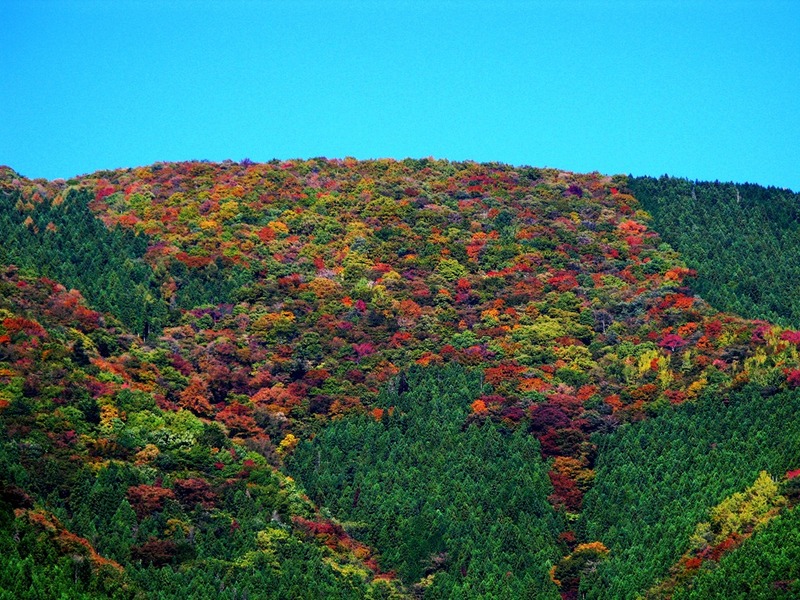 In addition, there is a huge lake, Lake Okutama, where you can enjoy the trees surrounding the lake changing their color. Ukihashi Bridge floating on the lake is one of the renowned spots in the area. Mitake Valley, which is located on the upstream of Tamagawa River is situated just a few steps away from the Mitake Station on the JR Ome Line. 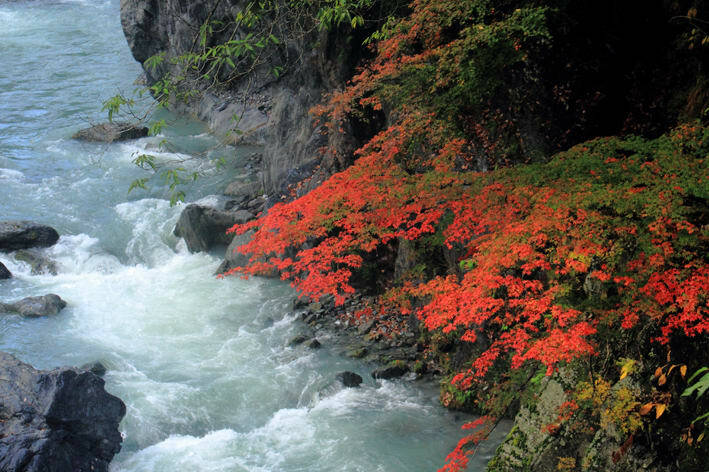 The valley, one of the 100 best waters of Japan, is another place where you can enjoy the beauty offered by the valley. The trees on the both shores are dressed in red, offering stunning scenery. This is a spot for everyone as there is a well-established promenade. There is a huge golden gingko tree in front of Gyokudo Art Museum nearby, and illuminated view of the tree at the evening is a must-see! 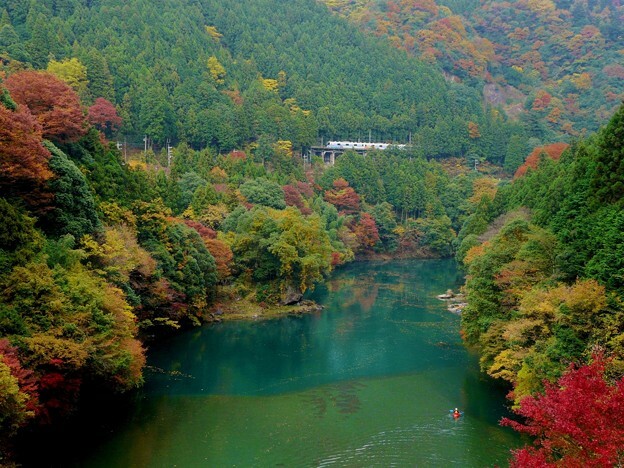 There lies Hatonosu Valley, a valley considered to be the most beautiful valley in Okutama area, underneath the 40m (131ft. )-deep cliff. There is Shiromaru Dam on the upstream of Tama River, which was built by damming up Tama River. There is a suspension bridge where you can enjoy viewing the breathtaking view. Showa Memorial Park situated by Tachikawa Station is a national government park. This park serves as a recreational area for families where you can enjoy cherry blossom viewing in the spring time, while you can enjoy the view of splendid duet of yellow and red autumn leaves. In addition, there is a Japanese garden inside the park that you can enjoy the autumn leaves within the atmosphere filled with the essence of Japan. As we have shown you today, there are so many autumn-leaf viewing spots in the suburbs of Tokyo. We hope you will visit these areas to enjoy the autumn leaves with the atmosphere a bit different from Tokyo.